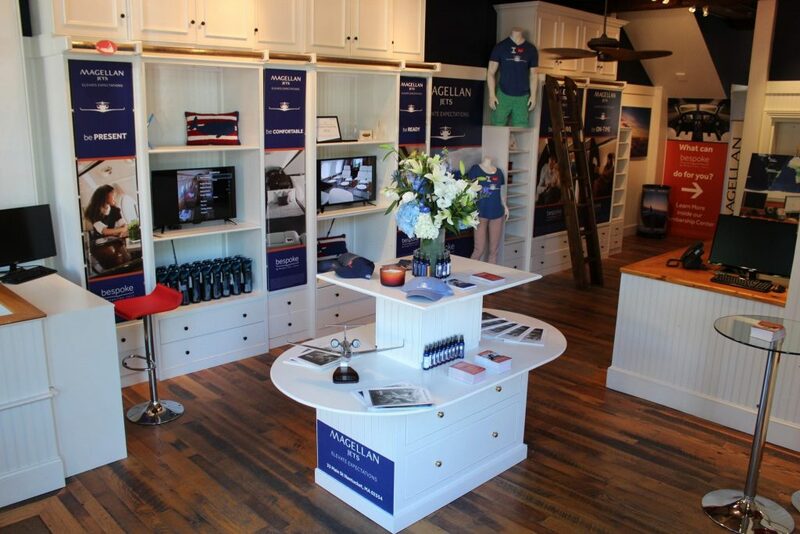 Magellan Jets recently launched one of the first of its kind brick and mortar Membership Centers on Nantucket island. Only a short walk from the ferry, the convenient, historic location welcomes new and existing members to learn about the latest in Magellan Jets’ membership options and experience the personalization of private travel. As many of the private aviation providers move toward using things like phone apps to cut down on human interaction, the Membership Center allows Magellan Jets to maintain the face-to-face interaction that helps personalize the private travel experience. Consultants are available Monday-Sunday to answer any questions you might have about your travel needs. Magellan Jets recently re-branded its build-a-card membership package and launched the revolutionary concept as “Bespoke by Magellan Jets“. This customizable solution combines Magellan Jets’ digital tools and consultative approach to bring members through a personalized process as they select the type of aircraft, number of hours, and choose from an array of additional benefits and perks. “Nantucket is a favorite spot for our members in the summer months, and we wanted to create an innovative way to educate those visiting the island about just how personalized jet travel can be” – Magellan Jets CEO Joshua Hebert. Magellan Jets offers 9 different Jet-specific membership options for its clients. The back lounge area is dedicated solely to those memberships options highlighting specific attributes for some of the top aircraft offered including theGulfstream G450, Hawker 800XP, Hawker400XP, Challenger 300, and more. Need an instant charter quote for a trip this summer? Magellan Jets also has that covered at the Member Center with an On-demand charter quote kiosk. Customers are invited in and able to receive charter quotes on any upcoming flights they may be considering. The Membership Center is filled with some of the newest and hottest Magellan Jets gear being sported all over the island. Shirts, water bottles, cozies and even hand-sanitizers are some of the many products available from Magellan Jets. However, the Magellan Jets hats are flying off the shelves, so don’t be the only one not wearing one this summer. Make sure to stop in and see the Membership Center at 33 Main Street to learn what a Magellan Jets membership is all about before Summer is over!